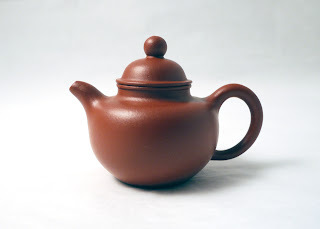 Some vintage teapots are listed separately on this page. For delicate, fragile items, we suggest buyers out of North America select Global Priority (USPS International Priority Mail) as the shipping method. 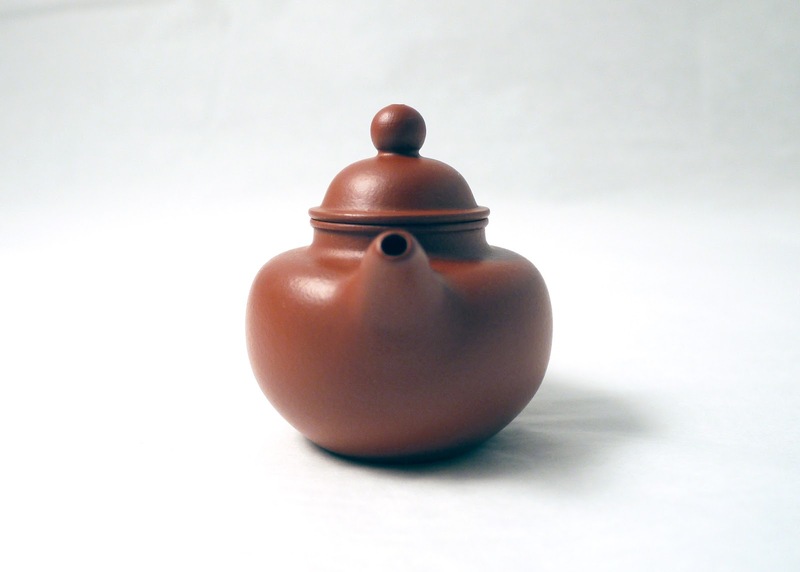 Each teapot has limited copies or single copy. We will update the web page as frequent as possible. But please forgive us if the teapot you order is out of stock. We will do our best to accommodate your needs. Photos on computer screens inevitably have color bias. We try to minimize the color biases. Meantime, we suggest you to use a calibrated computer screen (preferably not a laptop screen) to view the photos. Most clay colors are their typical colors of their own genre. But Qing Shui Ni and Pin Zi Ni could have slightly different shades of colors within their own genres. All the teapots are sincerely made and practical to use. 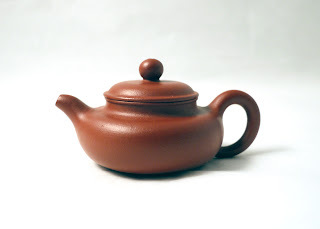 None of our teapot is of collection grade, although they are not necessarily less artistic or less valuable than many claimed-to-be collection grade teapots in the market. 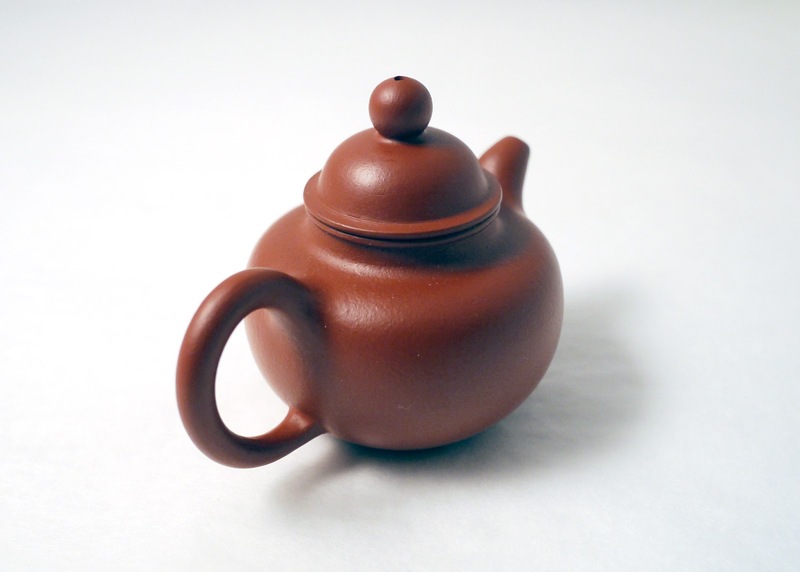 As hand-made pieces, none of the teapots is perfect. But all of them pass our quality control and hold very high quality standards for their price ranges. 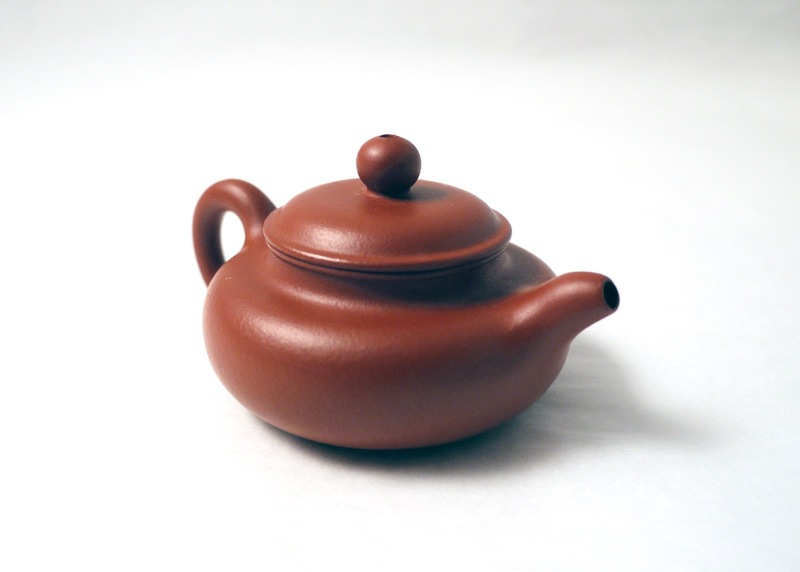 All the photos are available in large sizes, and we will do our best to point out anything that may affect the aesthetic value of a teapot. All photos can be clicked into large size. Please check out our online album if some photos can't be clicked to enlarge. Enlarged photos can be viewed here. Before taking the photos, our photographer used this teapot in the photo for a few tea sessions (something that's usually not allowed and doesn't usually happen). Therefore, the teapot in the photo is not 100% new. You may see some tiny tea stain spots on the enlarged photo. The teapot may have gained some patina too. But since it was used for only a few tea sessions before photography, it does look almost the same as a new teapot. Unless otherwise stated, all the teapots we shipped out are new teapots. According to the producer, this teapot is made with purple clay aged for over 30 years and made by an old yixing worker retired from Yixing No.1 Factory. 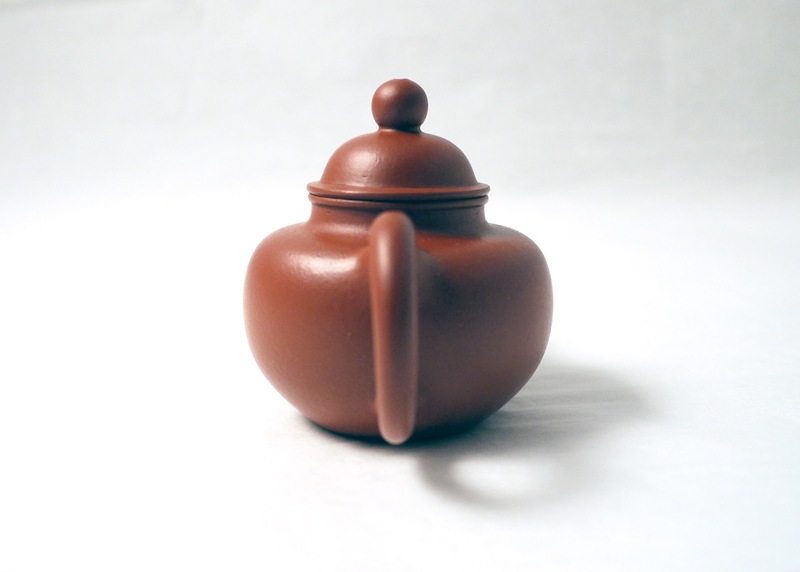 The craftsman is not famous and not active in yixing profession now, so his name stamp is not used for the teapot. 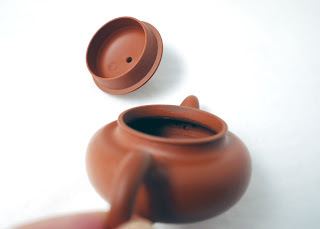 Besides, the teapot was made in order to mimic Yixing No.1 Factory teapots (with a pre-claim from the producer that it's not a No.1 Factory teapot and was not meant to fake the No.1 Factory products). 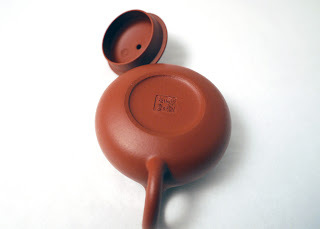 In my opinion, it's not as perfect as some of the very high quality No.1 Factory teapots, but it has a more authentic taste of good quality No.1 Factory teapots than some other products *claimed to be* No.1 Factory teapots. 1. 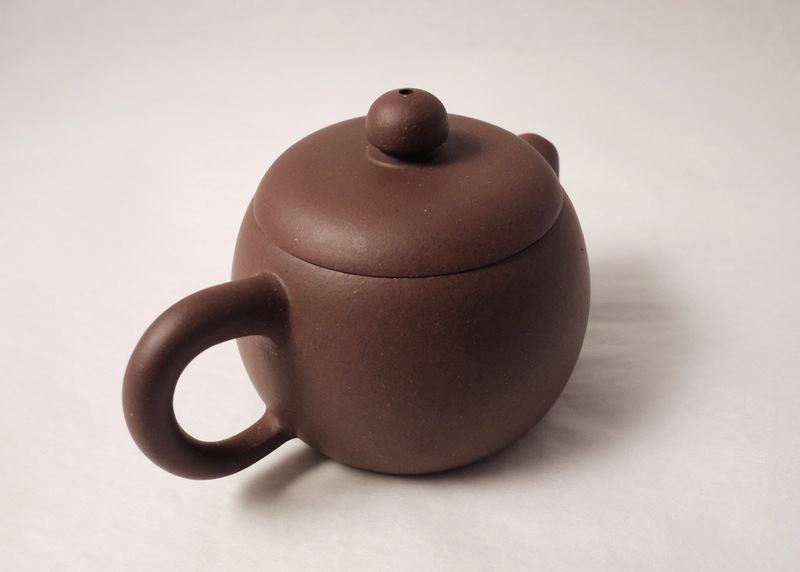 It uses highest kiln temperature possible and the teapot is slightly more high-fired than most other purple clay. I rinsed a new teapot with cold water and hot water for several times, didn't detect any earth smell on the rinsed teapot, and thought it would be ready for use without further pre-seasoning. 2. 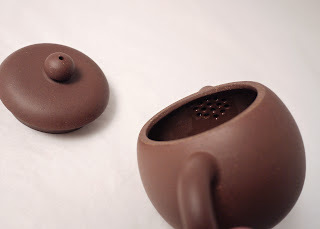 The wide opening and the shape makes it easy to use for all types of teas. 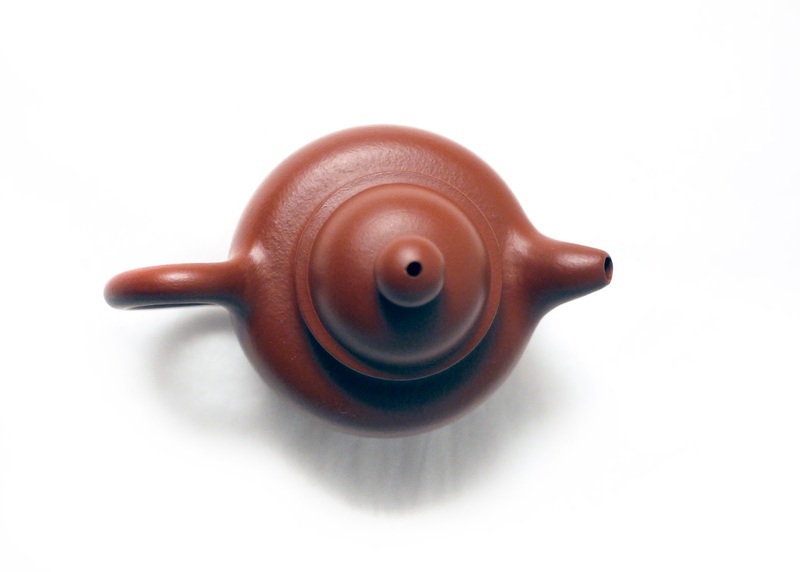 It shares the hassle-free feature of the Han Wa teapot down this page. 3. Wen Dan is a grapefruit/pomelo type of citrus fruit from southern China. 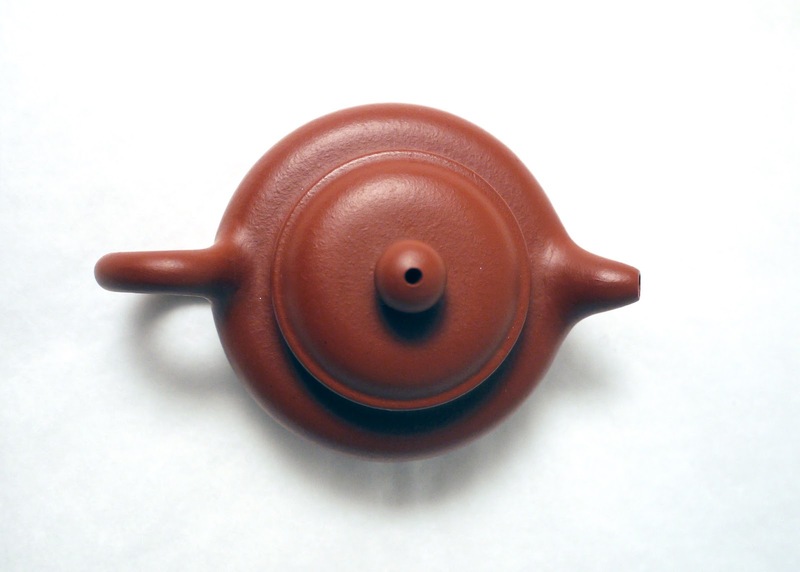 The teapot is named after the fruit due to its shape. This Wen Dan is a little "fatter" than the other two Wen Dan styles we have (down this page). 4. For those who care (I personally don't particularly care), this type of clay is claimed to have rich iron content. It's said to be able to make a difference in the tea liquor taste. But I personally think the taste difference is so small that it can often be ignored, if can be detected at all, depending on the type of tea and brewing method (that's for my own tea drinking habit and other people may have sharper senses than mine). But indeed it doesn't hurt to have some iron in your teapot. Side effect of this teapot - After being used for some time, the clay of this teapot starts looking very much like chocolate. 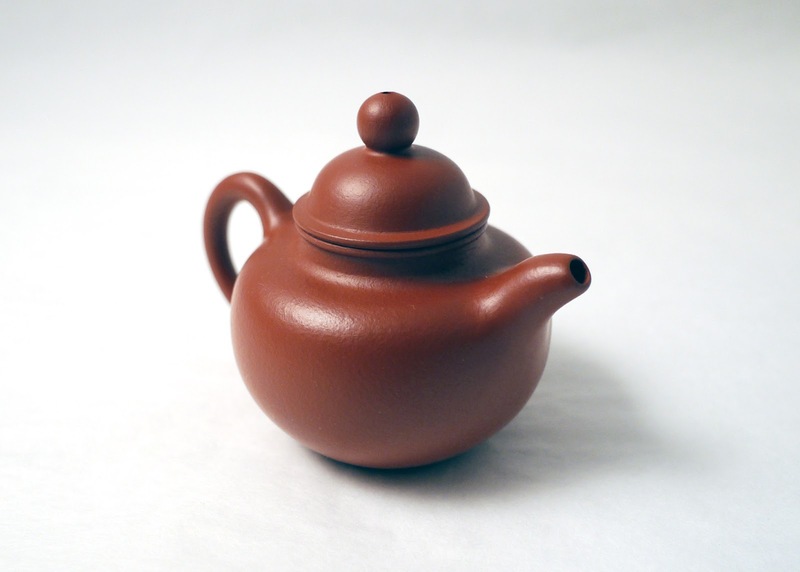 Facing a chocolate-like teapot day in and day out stimulates one's appetite of chocolate badly - some chocolate lover learned it the hard way! 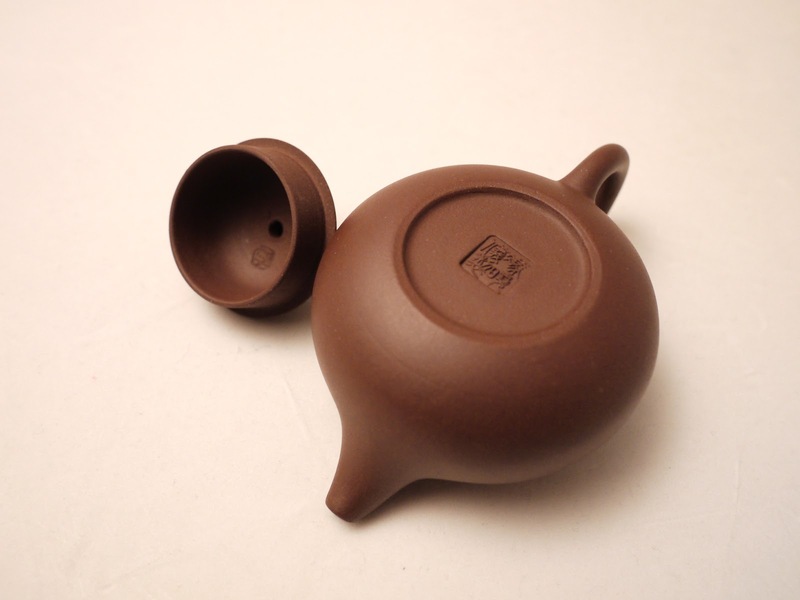 This di cao qing shui ping is out of stock and it's not likely that we will get more of it in the future. 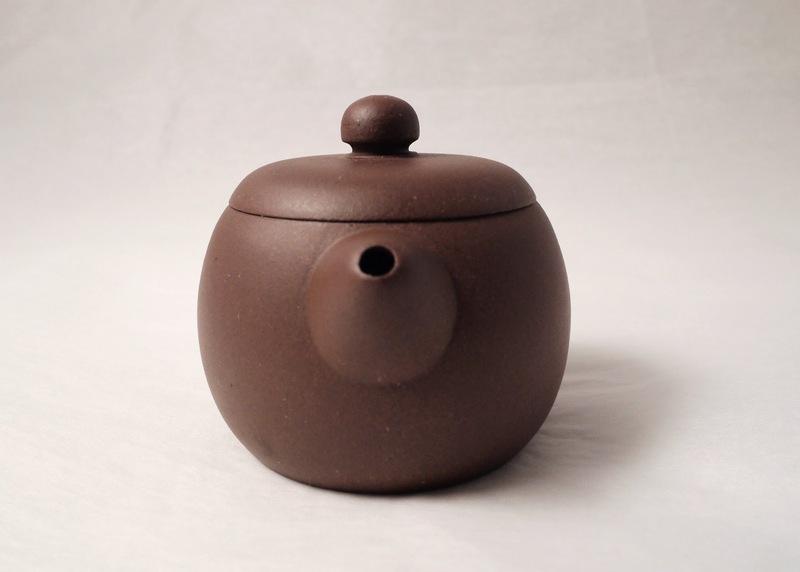 We also have a modern zhu ni version and a duan ni version of the same style by the same maker (Xu Peng), for the same price. 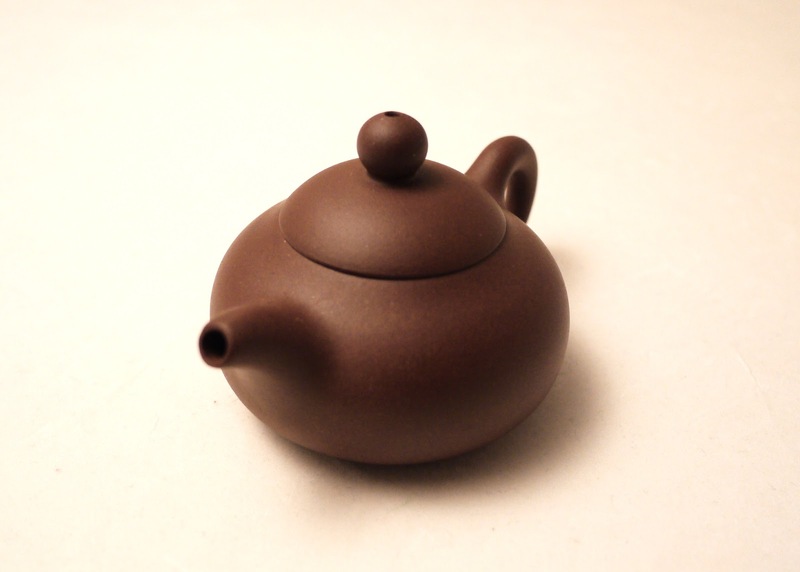 The zhu ni version looks almost the same as this one in shape but slightly smaller (about 125ml). It's used but clean (with some patina but no messy stains). The duan ni version is new, about 135ml. Interested buyers please contact us for more photos. 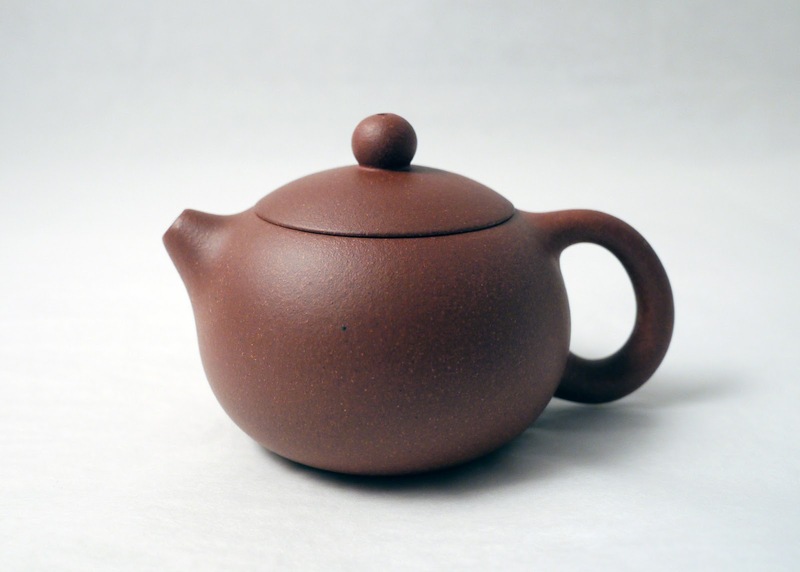 On this teapot, Mr. Xu, the craftsman, made his best attempts to mimic the classic shui ping teapots of Yixing No. 1 Factory. He used clay quality comparable to No. 1 Factory's, learned from old workers of No. 1 Factory, and studied this plain and practical style for years. His teapots look almost exactly the same as No. 1 Factory's, especially at the details of the handle and spout, where most copy works failed to get "it". 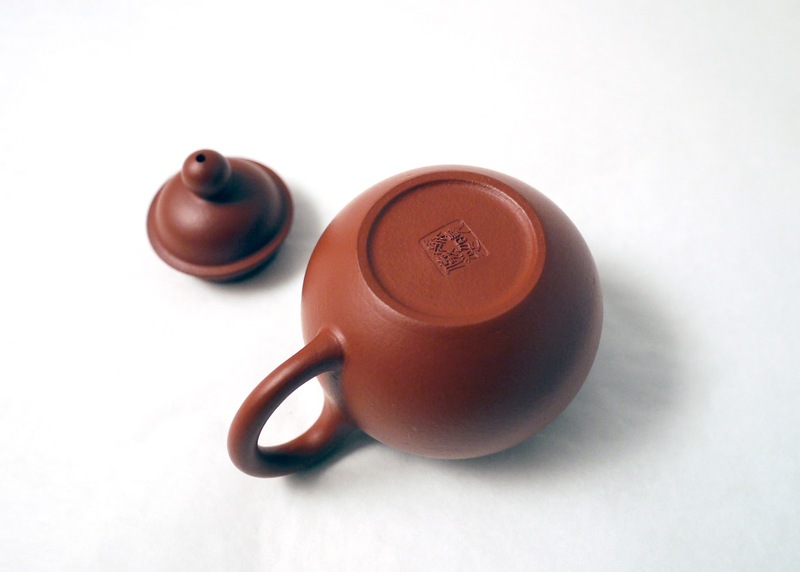 Most copy works following No.1 Factory style carry a "China Yixing" seal at the bottom, as used by No.1 Factory. 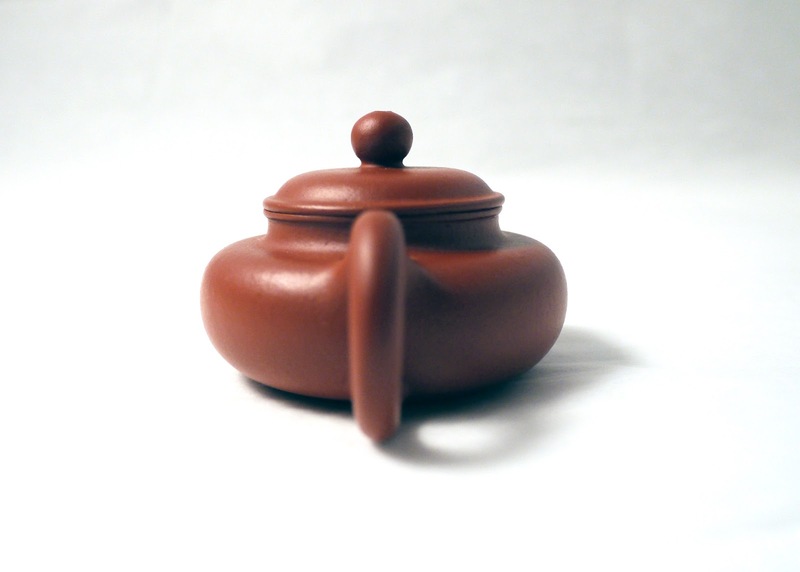 But our young craftsman put his own seal on the bottom and elsewhere on the teapots. 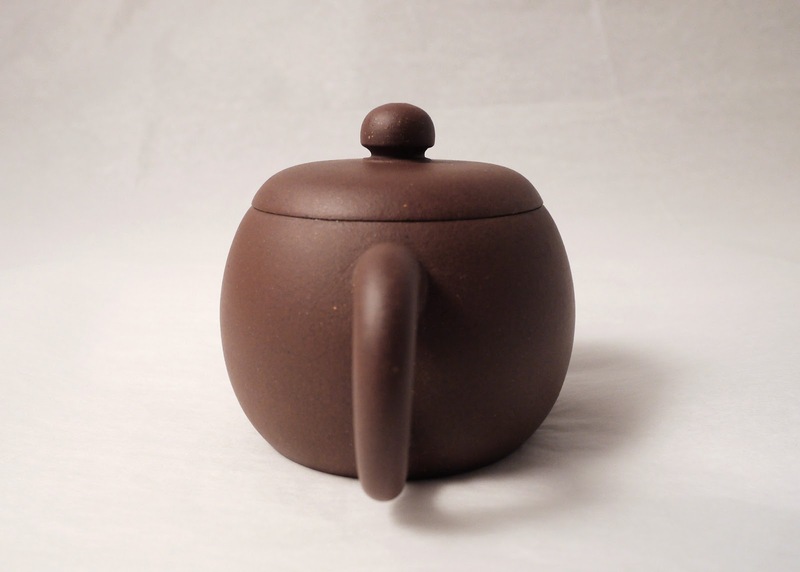 He believes his teapots are as good as (hmm... actually he meant to say better than...) the No.1 Factory teapots, and is confident that someday his teapots would be as sought after as the high quality ones among No.1 Factory teapots. Please be cautious of the small size and consider carefully if it's a good size for you. Duo Qiu means "ball on top of a ball". 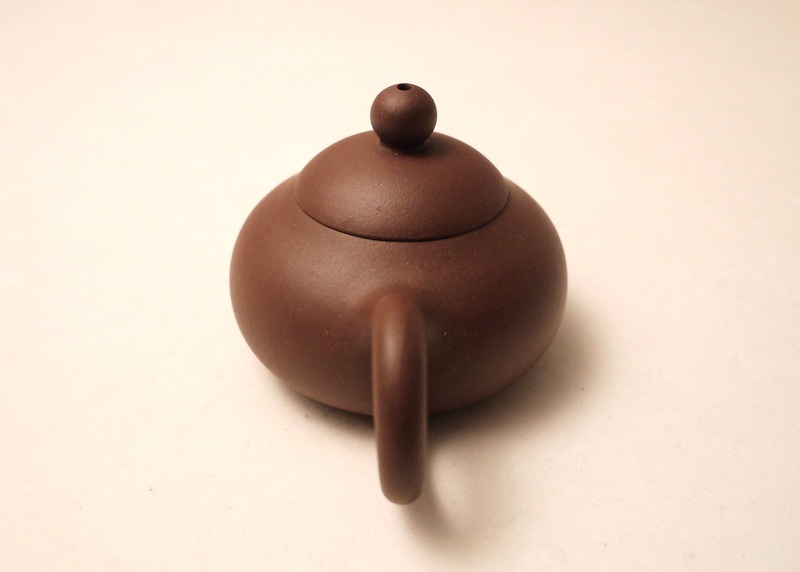 It describes the shape of the teapot. 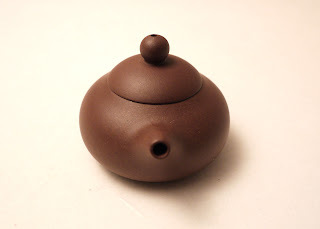 The belly, the head and the knob of the teapot look like big, medium and small balls, one on top of another. The clay is Zhao Zhuang (a mining location of Zhu Ni) Zhu Ni. It has a thin wall. Therefore, please use common caution used for zhu ni, and when using it in a cold weather, pre-heat the teapot with warm water before pouring boiling water into it. 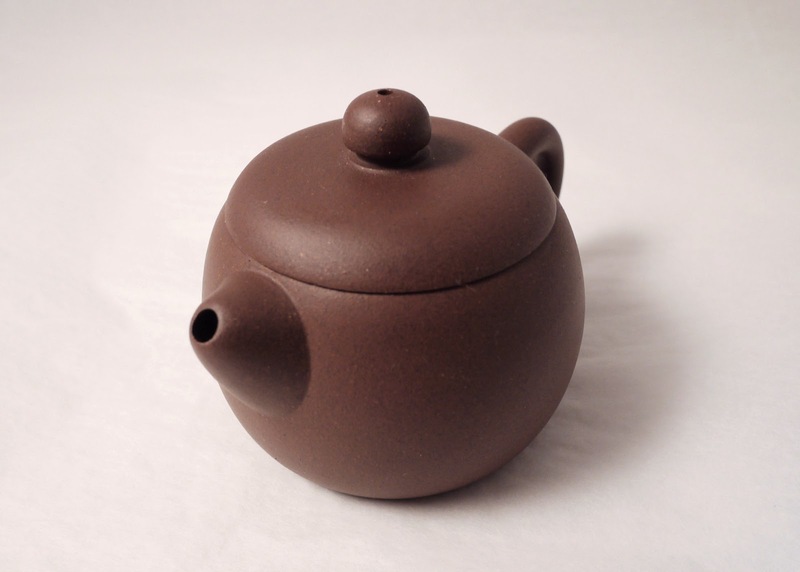 The color of zhu ni before kiln is yellowish. 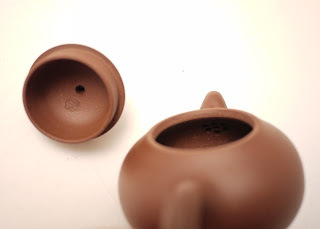 Therefore, on the final product, sometimes, there is yellow color on the inner rim of the teapot opening (as showed from the last photo). But the yellow color patch won't be large. 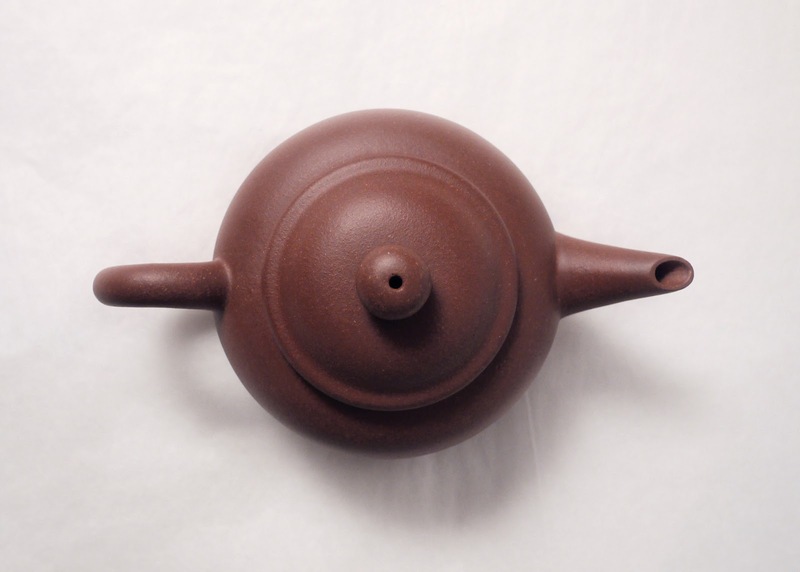 The first two photos show comparison of a brand new teapot of this style and another one of the same style that has been used for several times. 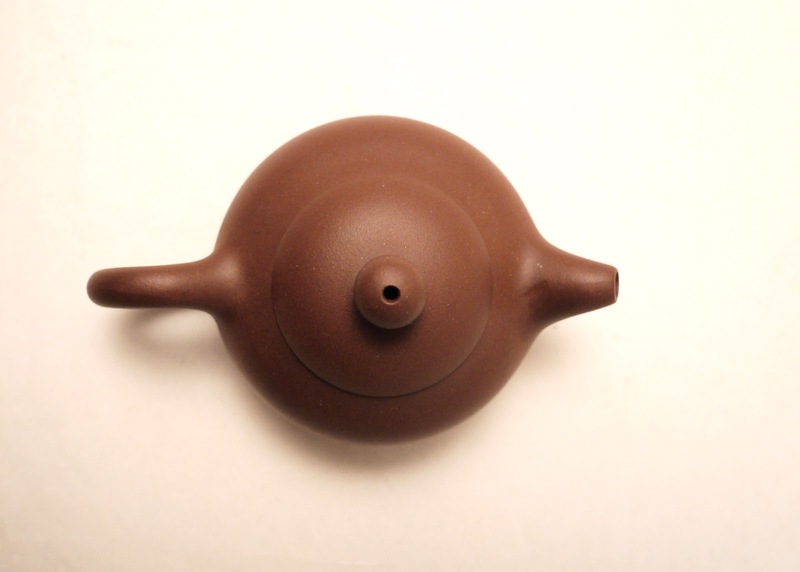 The difference is subtle because the used teapot has been used for only fewer than 10 times. 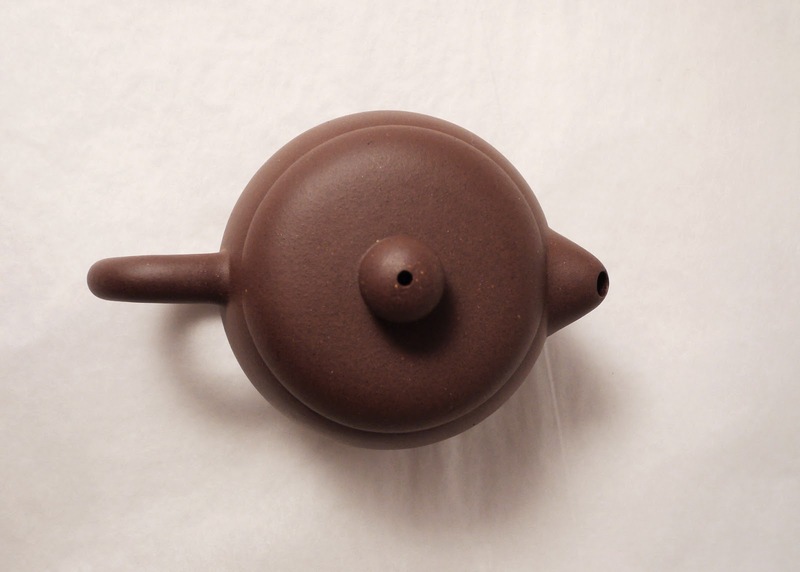 But the difference is still obvious and the pictures demonstrate how fast zhu ni teapots gain (clean) patina during tea drinking. We say it's "said-to-be" 1990s work. It doesn't mean we don't believe it's from 1990s. We are just not sure. As a matter of fact, I can't tell which yixing works are from 1990s or from certain era. It's sometimes easy to tell which ones are NOT from 1990s or certain era, but for most people, there is barely anyway to tell for sure which era a yixing ware is from, unless there is record of its history (e.g. if it's obtained from its creator or long-term collector). For following reasons, we think these "eggplants" are very likely 1990s works. 1. 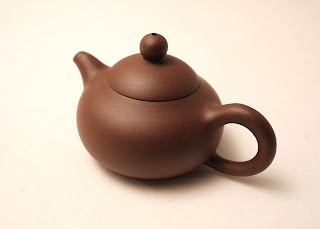 They are made of fairly good clay - but not top grade clay, which is usually used for teapots but rarely for fairy pitchers. 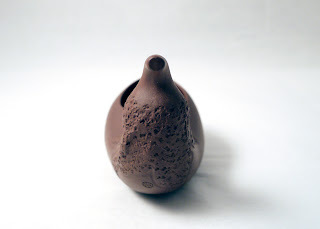 The clay texture is already comparable to some very good clay nowadays. This is consistent with the fact that 1990s fair clay is about the quality of today's very good clay. 2. The craftsmanship has a taste of 1990s. By "1990s taste", I mean they are carefully made, yet not meticulously made. 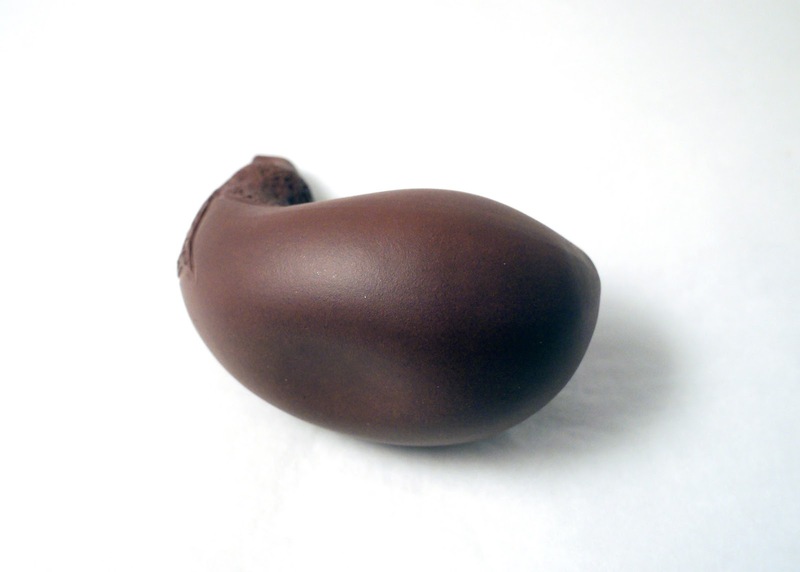 The eggplant is in excellent shape, but wasn't made with a perfectionism attitude and wasn't meant to be made as an expensive piece. 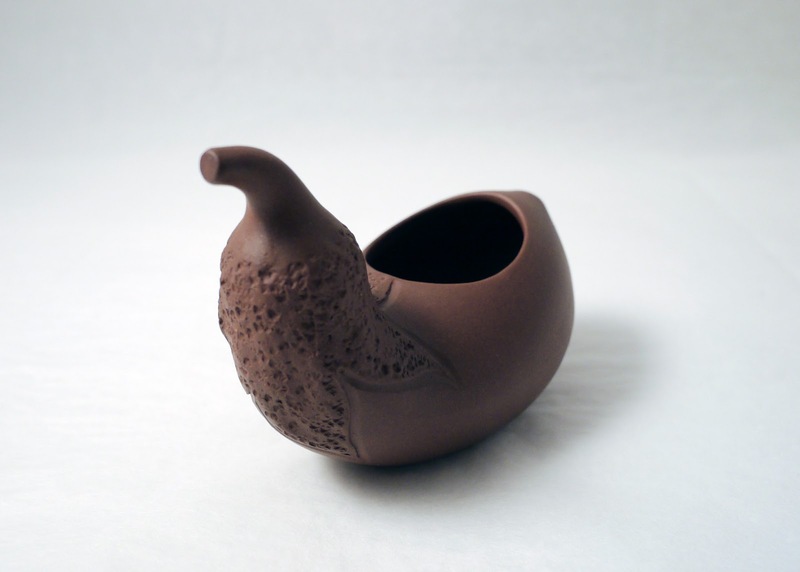 It was made as a piece of folk art and as a daily utensil, not a piece of academic art. 3. 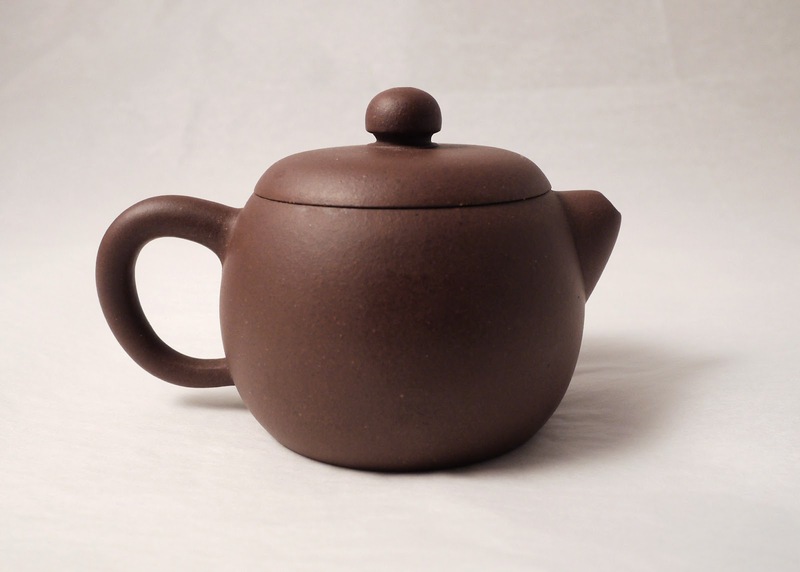 I don't think the creation date of yixing ware matters at all. I see a lovely eggplant, nice clay and good functionality. 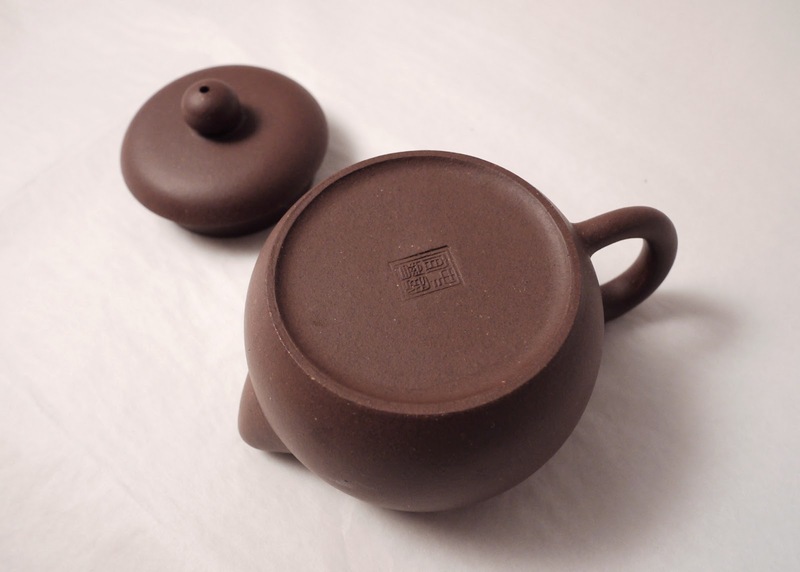 But I know DOB of a yixing ware matters to many people. Hence there should be some clarification here. 4. Below is also some "said-to-be" information. We think it makes sense, but have no way to tell for sure how true it is. 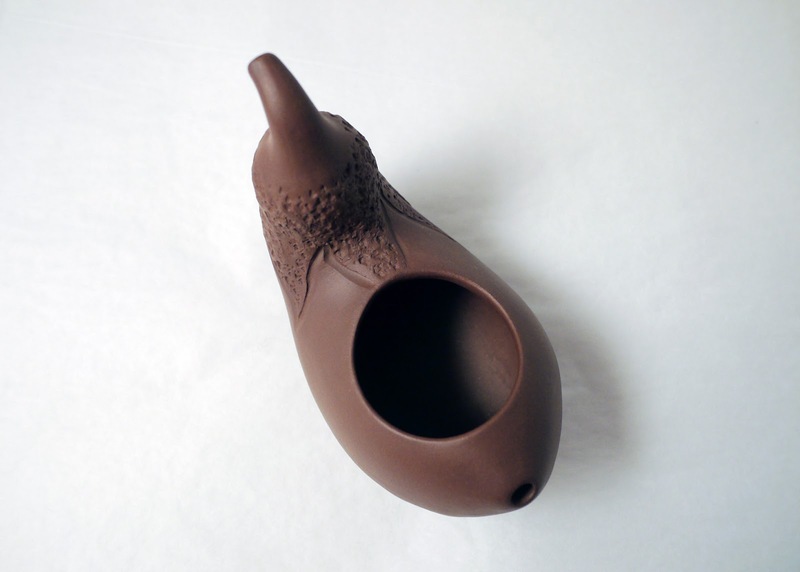 According to the supplier, these eggplants were made by Yixing No.1 Factory's branch factory cooperated by Yixing No.1 Factory and Taiwan Gu Nong Ceramic Arts. 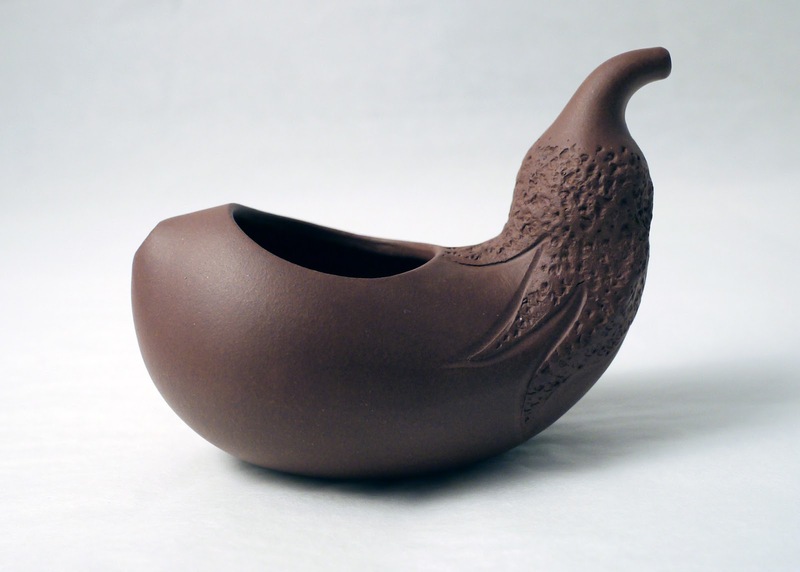 Gu Nong Ceramic Arts was one of the first organizations that introduced many high quality yixing wares to Taiwan, and participated in production of many high quality yixing wares. 5. 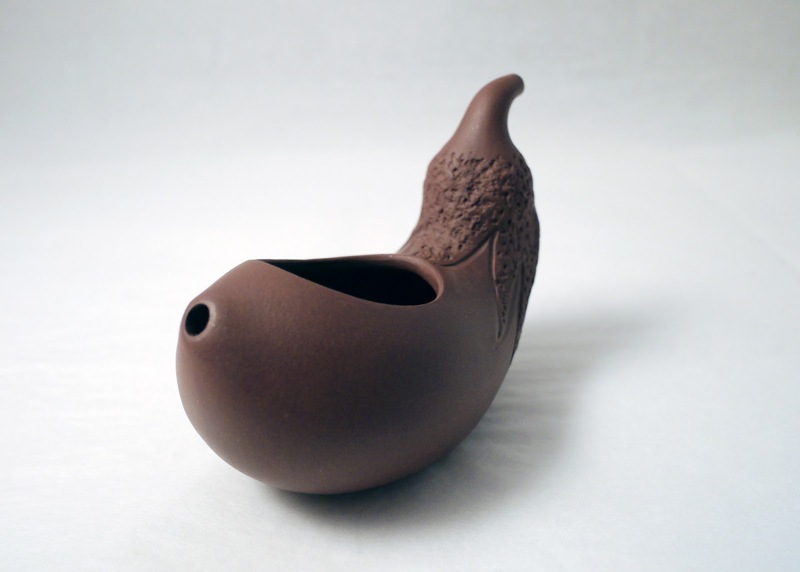 This fairy pitcher can also be used as a brewing vessel for green tea and red tea with "keep root" brewing method. 6. The current price is based on the supplying price. Since it's not likely that we could get more supply of these eggplants, the price might be adjusted in the future based on rarity. Shi Piao; engraved text is from Taoism Classic - "Do not lose your spirit to impetuosity; do not lose your root in lightness." The limited edition tea wares are not commodities we carry for long term. Some of them are personal belongings from friends and families, and some are inexpensive, practical tea wares that are barely profitable. All of them are not for profit, and prices of personal items are made much lower than their values. The purpose is send them to people who can make some use of them. Therefore, they can only be sold for tea buyers with their orders. They are not sold separately, and basically none of them is anything precious or "must-have" anyway. For any of the limited-edition pieces, please contact us for invoice. 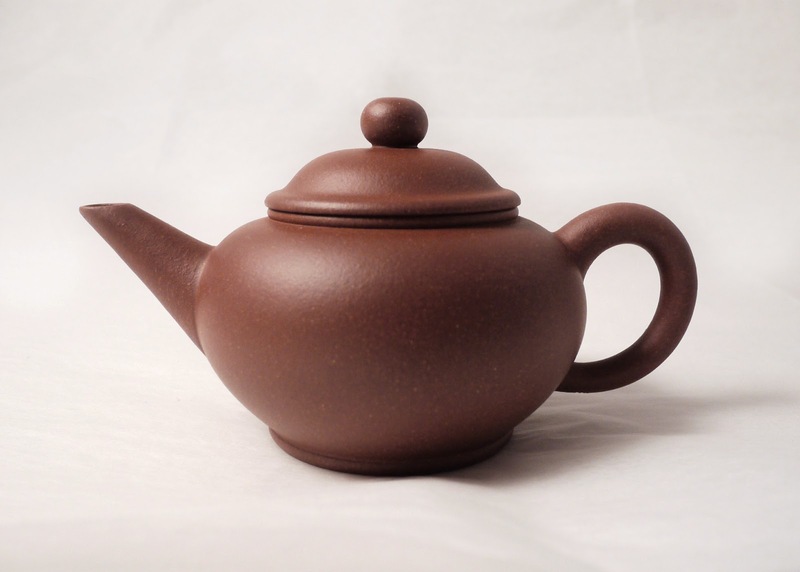 Large antique style yixing teapot with flower pattern from CCCI. $25, shipping included, and shipped to US address only. (If the address is east to Ohio and north to Virginia, then the price is $19, shipping included.) Style: Tall "Dan Bao" (egg-shape). 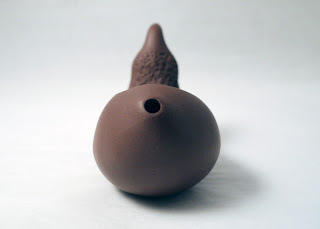 Clay: pin zi (mixed purple). A little larger than 500m (17 oz.). The large size makes it only practical for black tea or large volume brewing of puerh or hei cha. CCCI is a large yixing dealer of America. 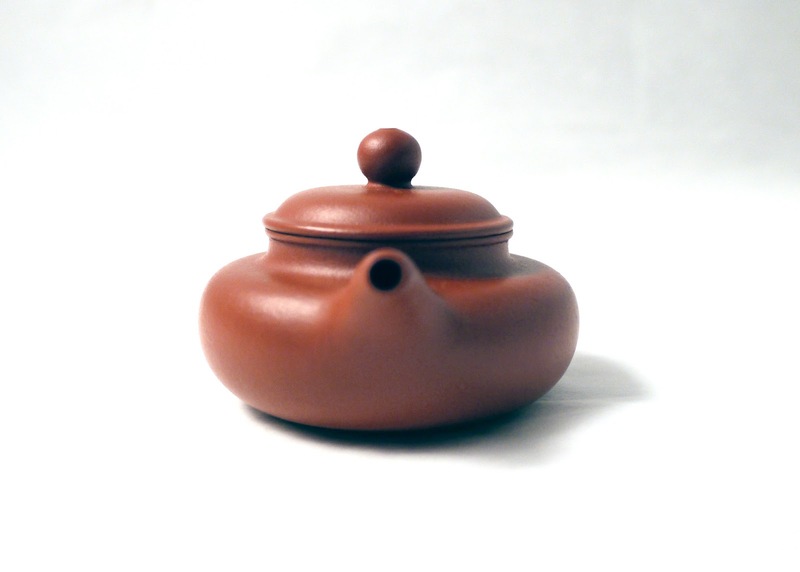 Teapots of this brand generally have mediocre clay grade, but all their teapots are safe to use. 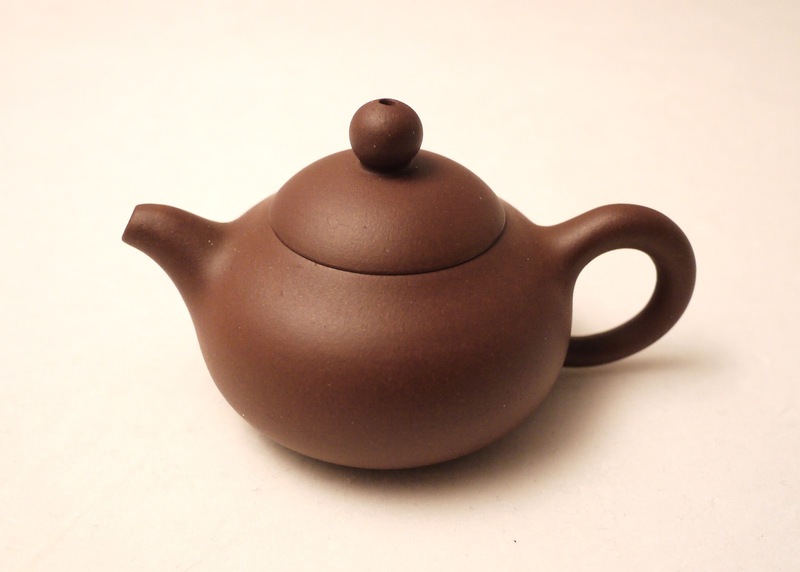 This teapot's craftsmanship is not artistic, but generally ok. The hand-painted flower pattern and the brass handles are very well made and similar to the style of some yixing large teapots of the old days.